We are in the very center of Congo because we want to know where and how many bonobos remain in this forgotten forest of 50,000 sq km. What threatens them and other large animals like the elephant and the okapi? Our ultimate goal is to bring real protection to some part of the forest between these rivers: the Tshuapa, Lomami and Lualaba (TL2). The compass sets the direction, the observers follow and porters are last. Our teams move out across the forest to specific locations, using GPS waypoints to guide them along a map-determined route. They follow a well-tested protocol of field methods to discover the presence and abundance of forest animals. In May and June two teams were doing just that, but Maurice’s circuit, described here, had a special mission. A view towards Djonga as the team climbed the hills between the Tshuapa and Lomami watersheds. Maurice was to lead a team to go to the far west of the TL2 zone to where there is a scattering of small communities called Djonga. Why? Because those communities were angry, angry about conservation. We had heard that a group from further west, one professing to work for conservation, had come to Djonga last year and something went wrong, very wrong. We rely on the good will and support of all the villages in this 3-river area. We need the Djonga population to protect the far west flanks of TL2. 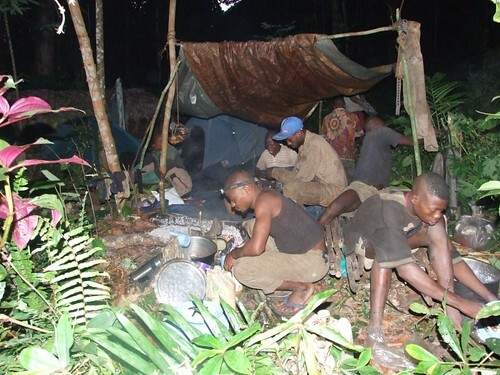 The first stage of the trip was the trek from Obenge to the first Djonga village through the blocks of E15, D15 and C16. It took 11 days. Crispin crossing forest towards Djonga. Although this stream has a white sand substrate it is clear unlike the black water streams in the north. Djonga is a cluster of small settlements surrounding several islands of savanna near the Tshuapa River. 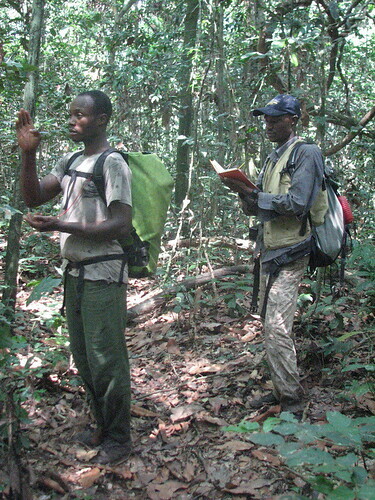 It took Maurice, Crispin and their team eleven full days to march across uninhabited forest between Obenge and Djonga. This was a major trek with nothing but GPS guidance, even by the standards of these seasoned TL2 explorers. The expedition encountered no people and very little sign of human passage in the crossing to Djonga. During the recent war years, however, army detachments, Mai Mai groups, and various armed men under minimal control crisscrossed this forest. 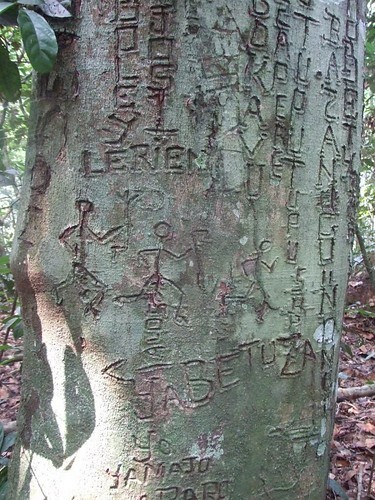 They left their noms-de-guerre and often a date carved on tree trunks. They also encountered little sign of animals. Tracks or dung of okapi, buffalo and bongo were rare. Was this because they had been hunted out, or because the forest soils were impoverished ? Only monkeys were abundant: including the new species of monkey, Lesula, first found close to Obenge. 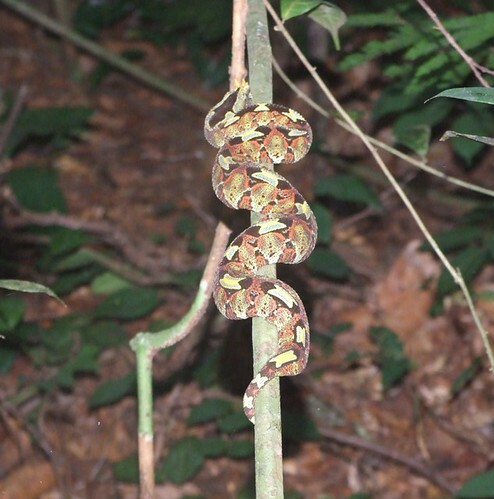 Hardly a large mammal but this viper was worth a photo along the trek to Djonga. It’s not usual to see them climbing. Exhausted the team finally marched out of the forest into the clearing of Bolota the most northeastern of the Djonga villages. They were a strange sight indeed in a community as insular as this! And it felt a bit dangerous considering the last visitors had indeed made themselves unwelcome…. Weary but cautious, Maurice prepares to meet the village elders. This entry was written by Terese Hart, posted on 2008-07-24 at 2:53 pm, filed under About the project. Bookmark the permalink. Follow any comments here with the RSS feed for this post. Post a comment or leave a trackback: Trackback URL. Wow, that landscape shot of the canopy is unique. Always nice to find a hill and get your head above the trees! Why am I surprised, you may ask. The Congo basin is very flat, and you never get any views unless in an airplane. 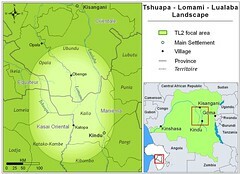 Out of interest, what is the altitude of the watershed between Tshuapa/Lomami at that point? Another wonderful post, thank you. We’re keen to hear more about this fantastic expedition – keep the posts coming! Fascinating post, y’all. I’m very interested to learn what happened in the villages and what the previous “conservationists” had done to anger these people. Definitely worried about the lack of large mammals, too. Great stuff. True Adventure. 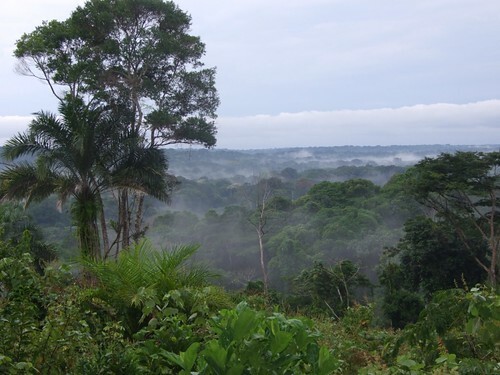 You’d think an area of undisturbed rain forest that large would be teeming with life, including mammals. That seems quite odd. Perhaps the villagers have already trapped out the larger animals. The various militias that have passed through may have hit it hard for bushmeat even if they didn’t stay long. I hope you can find some answers. Great post. Best Wishes. very beuatiful pictures and very interesting story. it shows that this landscape has a lot of different faces. i wonder how it is possible to establish a functioning nature reserve in dense populated areas. We really want to get botanists into TL2 and there are some excellent (exceptional)Congolese botanists. Maybe in a year, maybe two? Fingers crossed. That would be an entirely different sort of expedition with important base camp where we would build a local plant dryer. And then all the collecting paraphenalia. THERE has been no collecting here to my knowledge. 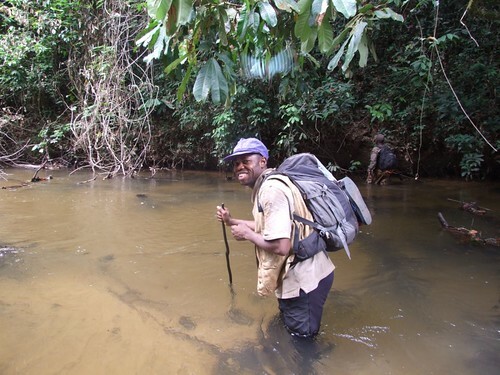 Michael, Yes the Sankuru Reserve stretches to the west from Djonga and has many many challenges. 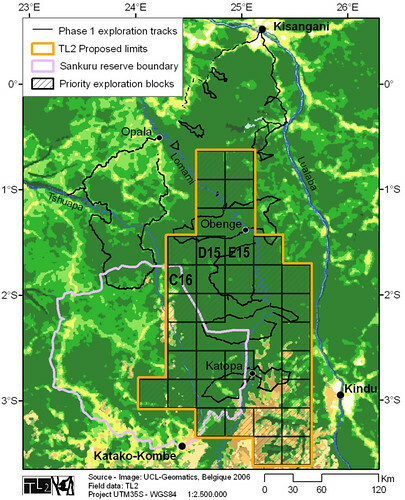 My own feeling is that if they can maintain forest cover over most of the reserve … ie keep out logging operations and effectively make large zones into “NO settlement or farming” zones, THEN Sankuru has done a large service for the World, for the Congo and for TL2. I think however that it is very unlikely that it will maintain viable populations of animals over the longterm….too many people with a bushmeat based diet and economy. i am from there,is very important your interst at this part of word . i need to know about pre’-colonial and colonial history of djonga popular consigned so far in many colonial repport at belgium in french or in flammend.help!congratulation for your work.i can to critique after to finish to read.for now i am busy,sory. but your home is my home in my mind.